In this workshop, Mary Ann will delve deeply into the simple of strategy. Mary Ann’s workshop was four Sundays that brought many insights and a new perspective to those who participated. Mary Ann shared her wisdom about two of the most important aspects of the Human Design experiment: waiting and the mind. Waiting. We all have to wait. Mary Ann goes into great depth with a deep understanding of the process of waiting and what it truly means. Waiting is the beginning of the experiment for all types – including the Manifestor. Without waiting – there can be no transformation. It is waiting that begins the deconditioning process. For the mind it can look like nothing is happening – but in truth it is what activates the cellular transformation. Observing the constant chatter of the mind is the beginning to relaxing in the back seat. No one can relax if what the mind says about them is believed. The illustrations are excellent visual support. Mary Ann Winiger is well-known within the Human Design world for her dedication to helping people transform their lives with strategy and authority. This is the first time in many years that Mary Ann is offering a workshop online. This workshop is open to everyone. Human Design is an incredible logical system. The complexity of the knowledge can take one’s breath away. At the very foundation is strategy. It is often easy for this very simple yet profound aspect to get covered over by the layers of information that makeup the Human Design System. Yet, to miss the depth of the simple is to miss the very core of personal transformation. In this workshop, Mary Ann will delve deeply into the simple of strategy. It is the first time she is bringing her live Immersion work to the online environment. She brings the depth of her own experience, wisdom, sensitivity to aura dynamics and her own deep transformation to her workshops. Mary Ann will be available to respond to your questions, concerns and needs. Mary Ann is a 6/2 Pure Generator born on the Left Angle Cross of the Alpha. She has lived two full cycles off the roof and has great wisdom about how Human Design can transform you, your relationships and your life. She brings the depth of her own experiment – she was one of the first people to actually take the information from her reading with Ra and jump into living the experiment. She knows first-hand how difficult and shattering this process can be. The Human Design experiment can turn your whole life upside down but it is this that brings your rebirth. You can finally live who you were born to be. We hope you can join us at IHDS for this four Sunday workshop with Mary Ann. Bio of Mary Ann Mary Ann Winiger has been deeply involved in Human Design for 20 years. Her entire Human Design education was from Ra Uru Hu directly. Mary Ann is a licensed Human Design Analyst with additional certification in Family analysis, Partnership analysis, Life Cycle analysis, She is an IHDS certified LYD Guide, Rave ABC’s Teacher, Rave Cartography Teacher and is certified to train LYD Guides. 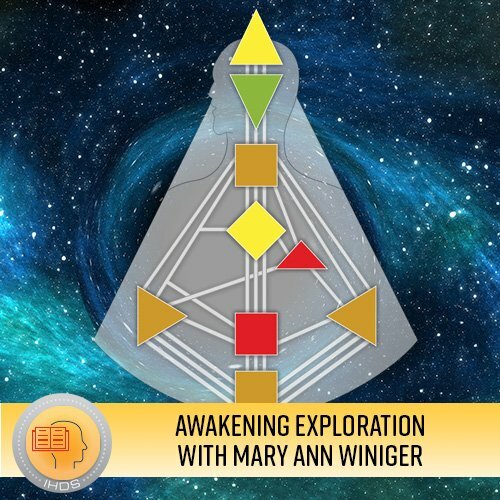 Mary Ann Winiger has lived a diverse life spending many years in the corporate world and in the world of ashrams where she extensively studied eastern spirituality and philosophy. She is the author of A Revolution of One, which is a compelling account of her personal journey and transformation using Human Design knowledge to change her life. Mary Ann was the previous Director of Human Design America and wrote the Human Design KISS booklets as well as creating a number of Human Design CD’s. She has been teaching and giving Human Design workshops for 15 years. She has a down-to-earth approach and a knack for making complicated knowledge simple.